The Buffalo Sabres didn’t merely have a splash of cold water thrown in their faces on Thursday night. The Colorado Avalanche hit them with the liquid contained in an entire bucket. The final score ended up as 6-1 in favor of the Avalanche, although many in the crowd of 15,394 had gone when Colorado added its last two scores. Thus some of the enthusiasm surrounding the team after it had won two straight games to earn its first winning record in more than five years was, well, washed away. Sabres’ forward Kyle Okposo thought he saw signs that this might have been coming on Wednesday, when he didn’t think his team was sharp during practice. The tone in this case was set just past the midway point of the first period. Colorado had the first two power plays of the game, and converted on both of them (Tyson Jost and Colin Wilson). The Avalanche moved the puck around beautifully with the extra man, and got itself into scoring position. The goals became somewhat inevitable. Then when Carl Soderberg made is 3-0 late in the period, the game already felt close to over. Buffalo appeared to get one back in the final minute of the period, only to have Okposo called for goalie interference after a review. Buffalo had some chances to get back in the game in the second period, thanks to three straight Colorado penalties. But the Sabres couldn’t convert on any of them, part of an 0 for 7 night on the power play. It’s difficult to win doing that. There was one last turning point in the game. After Beaulieu’s shot from the blue line was only partially stopped by Semyon Varlomov and dribbled into the net, the Sabres caught a bad break when a pass off an official’s skate led to a turnover. That, in turn, led to an open shot for Nathan MacKinnon, one of the game’s brightest young stars. 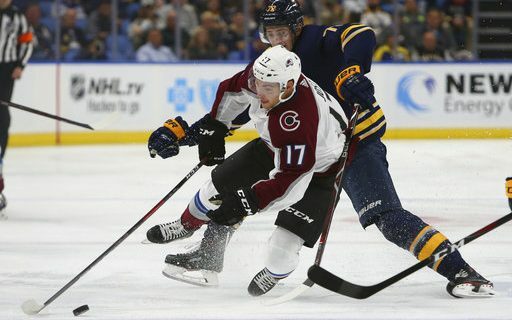 Bingo – it was 4-1, Colorado, and it was tough to imagine the Sabres coming back against a good Avalanche team that looks like it will make some noise in the West this season. From there it seemed to be a matter of playing out the string. But in the last five minutes, the Sabres gave up breakaways to Alexander Kerfoot and MacKinnon. They both beat goalie Carter Hutton, who actually made some very good saves along the way in spite of the final score. When the game was over, the four-game homestand was finished as well. Buffalo finished 2-2, losing to a pair of good teams and surprising a Stanley Cup Finalist with a deserved victory. That’s not bad for a team that finished last overall in 2017-18. On an individual basis, the results were equally mixed this week. Eichel was consistently dangerous, Hutton looks like an upgrade on the goaltending, Rasmus Dahlin – who had his first NHL point on Thursday – had some good moments for an 18-year-old defenseman in his first four games, and Conor Sheary seems to be a nice pickup. On the other hand, the team still looks like it needs to develop some more NHL-ready players. Experimentation will no doubt continue in the weeks ahead. Tage Thompson had some rough moments, and Casey Mittelstadt appears to be having trouble finding space to operate. They are young players, and so that’s to be expected. The second line hasn’t done much, but Jeff Skinner is too good of a player to let that go on much longer. The Sabres head West for a five-game road trip that starts in Arizona on Saturday. If they need motivation, they only need to think about the outgoing performance on Thursday that reminded everyone that there are no short cuts in a rebuilding project.